Early diagnosis of invasive pulmonary mycoses in immunocompromised patients is a major determinant of effective treatment. However, making a reliable diagnosis is challenging and often requires trans­bronchial or even surgical lung biopsy. We provide evidence that endobronchial ultrasound-guided transbronchial needle aspiration may be an attractive, less invasive diagnostic method. Endobronchial ultrasound-guided transbronchial needle aspiration was not only a diagnostic clue in the presented kidney transplant recipient with invasive pulmonary mycosis but was useful in assessment of treatment efficacy. We present a kidney transplant recipient who developed invasive pulmonary aspergillosis and in whom EBUS-TBNA was the only diagnostic clue for pulmonary fungal infection. A 46-year-old male patient was admitted to the Department of Transplantation Medicine and Nephrology because of high fever (up to 40°C), chills, severe dry cough, and general weakness for 4 weeks. He had undergone kidney transplantation due to chronic renal failure secondary to polycystic kidney disease 3 months before admission. Since then, he had been receiving immunosuppressive treatment with prednisone, tacrolimus, and mycophenolate mofetil, as well as co-trimoxazole and valganciclovir. His medical history also included right native nephrectomy due to polycystic kidney disease 3 years ago, arterial hypertension, and multiple hepatic cysts. Physical examination on admission revealed a febrile patient (38°C) in relatively good general condition, with normal heart, breath, and bowel sounds and no abdominal tenderness, particularly in the left lower abdominal quadrant (the site of the transplanted kidney). Basic blood laboratory studies showed an elevated C-reactive protein level (44.6 mg/dL), decreased hemoglobin level (106.0 g/L), normal white blood cell count (8.1 × 109 /L) with neutrophil predominance (80%), and elevated creatinine level (22.0 mg/L). Urinalysis revealed no abnormalities. Chest radiograph demonstrated slight pulmonary hilar enlargement with no clear evidence or parenchymal consolidation or pleural effusion. Abdominal ultrasonography showed an enlarged native left kidney with multiple cysts filled with echogenic fluid and multiple cystic liver lesions. Because bacterial infection of the native cystic kidney was suspected, treatment with antibiotics was initiated (ceftriaxone and clarithromycin, followed by amoxicillin with clavulanic acid, clindamycin, imipenem); however, there was no clinical improvement. All blood and urine cultures were negative. Cytomegalovirus and Epstein-Barr virus infection were excluded with polymerase chain reaction method. Blood tests for Aspergillus, Candida, and Cryptococcus antigens were negative. Chest computed tomography revealed right hilar lymphadenopathy, a mass in the apical segment of the right lower lobe (RB6), and pulmonary nodules in the left lung (Figure 1). A tentative diagnosis of posttransplant lymphoproliferative disease was established. The patient was referred to our Department of Internal Medicine, Pneumonology, and Allergology for further diagnosis. Bronchoscopy showed edematous bronchial mucosa in the area of the division of the right main stem bronchus into the upper lobe and intermediate bronchi. Large heterogeneous nodular masses behind the posterior wall of the right main bronchus and just below the upper lobe carina were identified with EBUS. Bronchoalveolar lavage of the right apical segments and EBUS-TBNA of the right hilar lymph nodes (Figure 2A) were performed. Flow cytometry analysis of lymph node aspirates showed significant predominance of neutrophils (83%), with only 4% lymphocytes and 3% monocytes. Direct microscopy and polymerase chain reaction for Mycobacterium tuberculosis complex (GeneXpert MTB-RIF, Cepheid, Sunnyvale, USA) of bronc­hoalveolar lavage fluid and the material from EBUS-TBNA did not demonstrate mycobacteria. Bronc­hoalveolar lavage fluid cultures were positive for Escherichia coli (105 CFU/mL) and Candida albicans (104 CFU/mL). The immunoenzymatic test for Aspergillus galacto­mannan in bronchoalveolar lavage fluid was negative (index = 0.491, cut-off value < 0.5). However, cytologic examination of EBUS-TBNA revealed numerous hyphae (consistent with Aspergillus species infection), neutrophils, and foci of necrosis (Figure 2B). Given the signs and symptoms, the results of chest imaging, and the cytopathologic appearance of the EBUS-TBNA samples, together with the high probability of invasive Aspergillus infection (due to immuno­suppression), invasive pulmonary aspergillosis was diagnosed, and treatment with voriconazole (200 mg twice daily, orally) was started. Antimicrobial treatment with imipenem was continued as culture-directed therapy for Escherichia coli infection. Gradual clinical and radiologic improvements (Figure 3A and 3B) were observed. However, follow-up EBUS-TBNA after 12 weeks still revealed fungal hyphae in biopsy samples. Treatment with voriconazole was continued. 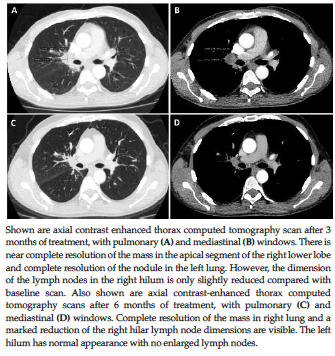 Computed tomography scan after 6 months of treatment showed further resolution of pulmonary and mediastinal lesions (Figure 3C and 3D), and no hyphae were detected in subsequent EBUS-TBNA samples. Antifungal treatment was continued for 8 months. The presented case shows that EBUS-TBNA is a useful tool in the diagnosis of pulmonary complications in immunocompromised patients. Because EBUS-TBNA is less invasive than transbronchial lung biopsy, it might be considered the sampling method of choice in immuno­compromised patients with pulmonary or mediastinal lesions adjacent to the large airways. To conclude, EBUS-TBNA can be used as a diagnostic tool in immunocompromised patients suspected to have invasive pulmonary fungal disease. It may offer a definite diagnosis even in culture-negative cases with the absence of fungal antigens in blood and bronchoalveolar lavage fluid. Kosmidis C, Denning DW. The clinical spectrum of pulmonary aspergillosis. Thorax. 2015;70(3):270-277. Trullas JC, Cervera C, Benito N, et al. 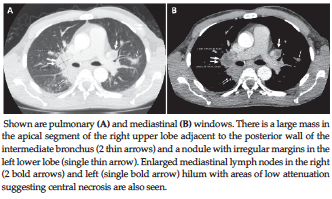 Invasive pulmonary aspergillosis in solid organ and bone marrow transplant recipients. Transplant Proc. 2005;37(9):4091-4093. De Pauw B, Walsh TJ, Donnelly JP, et al. Revised definitions of invasive fungal disease from the European Organization for Research and Treatment of Cancer/ Invasive Fungal Infections Cooperative Group and the National Institute of Allergy and Infectious Diseases Mycoses Study Group (EORTC/MSG) Consensus Group. Clin Infect Dis. 2008;46(12):1813-1821. Choi YR, An JY, Kim MK, et al. The diagnostic efficacy and safety of endobronchial ultrasound-guided transbronchial needle aspiration as an initial diagnostic tool. Korean J Intern Med. 2013;28(6):660-667. Casal RF, Adachi R, Jimenez CA, Sarkiss M, Morice RC, Eapen GA. 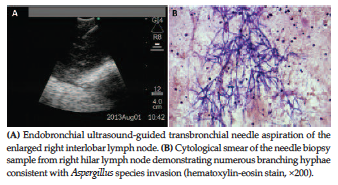 Diagnosis of invasive Aspergillus tracheobronchitis facilitated by endobronchial ultrasound-guided transbronchial needle aspiration: a case report. J Med Case Rep. 2009;3:9290. Navani N, Molyneaux PL, Breen RA, et al. Utility of endobronchial ultrasound-guided transbronchial needle aspiration in patients with tuberculous intrathoracic lymphadenopathy: a multicentre study. Thorax. 2011;66(10):889-893. Rano A, Agusti C, Jimenez P, et al. Pulmonary infiltrates in non-HIV immunocompromised patients: a diagnostic approach using non-invasive and bronchoscopic procedures. Thorax. 2001;56(5):379-387. Kupeli E, Akcay S, Ulubay G, Ozyurek BA, Ozdemirel TS, Haberal M. Diagnostic utility of flexible bronchoscopy in recipients of solid organ transplants. Transplant Proc. 2011;43(2):543-546. Pérez-Sáez MJ, Mir M, Montero MM, et al. Invasive aspergillosis in kidney transplant recipients: a cohort study. Exp Clin Transplant. 2014;12(2):101-105. Ellis ME, Spence D, Bouchama A, et al. Open lung biopsy provides a higher and more specific diagnostic yield compared to broncho-alveolar lavage in immunocompromised patients. Fungal Study Group. Scand J Infect Dis. 1995;27(2):157-162. Wang JY, Chang YL, Lee LN, et al. Diffuse pulmonary infiltrates after bone marrow transplantation: the role of open lung biopsy. Ann Thorac Surg. 2004;78(1):267-272. Pfeiffer CD, Fine JP, Safdar N. Diagnosis of invasive aspergillosis using a galactomannan assay: a meta-analysis. Clin Infect Dis. 2006;42(10):1417-1427. Guo JL, Chen YQ, Wang K, Qin SM, Wu C, Kong JL. Accuracy of BAL galactomannan in diagnosing invasive aspergillosis: a bivariate meta-analysis and systematic review. Chest. 2010;138(4):817-824. Sangoi AR, Rogers WM, Longacre TA, Montoya JG, Baron EJ, Banaei N. Challenges and pitfalls of morphologic identification of fungal infections in histologic and cytologic specimens: a ten-year retrospective review at a single institution. Am J Clin Pathol. 2009;131(3):364-375. Kriengkauykiat J, Ito JI, Dadwal SS. Epidemiology and treatment approaches in management of invasive fungal infections. Clin Epidemiol. 2011;3:175-191.